ComfortableConservatories, Conservatory Software for the window industry. Features and benefits. ComfortableConservatories boasts incredible features! See below! Can't find the information you are looking for on this page? Click here to ask a question! Can't wait? 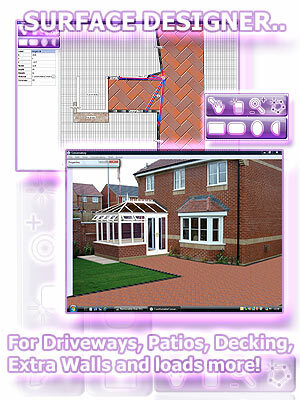 Please try our Conservatory software for yourself! Click here to obtain the un-restricted risk-free 14 day free trial! Leave a lasting impression of your company's professionalism by giving the customer sensational photo-reports as a quotation or with their order. There is every chance that customers will show their friends and family, further spreading the good word about your services, increasing referrals. In today's aggressive market place this perfect sales tool is a definite necessity. Photo "Before&After" Overlays. Very popular photo reports. and many other 3D reports.. FACT: Not only are ComfortableConservatories reports printable as normal, but they are eco friendly too. All reports can be emailed saving both paper & ink and of course the environment! We do not charge extra for this facility. Many of the reports can be scaled with user definable scales and show floor area, base area, conservatory volume etc. There are portrait and landscape style reports, which are supplied as A4, A3 and Letter sized (depending on country). Conservatory reports can also be emailed as .pdf files (& other) and photo-overlays can be saved as various graphic files which include jpegs (.jpg). Reports can be re-named and grouped. Multiple reports can be printed with a single click! 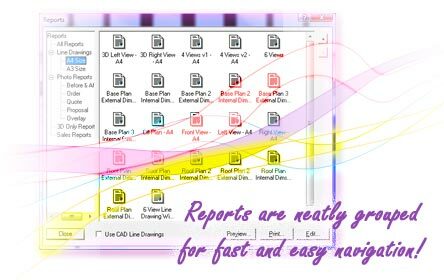 Reports can also be scaled to other paper sizes depending on your printer driver features. FACT: You can add your own logo to the reports and in many cases extra company information too! You can even create CAD drawings for planning. ...with the new integrated ComfyCAD! 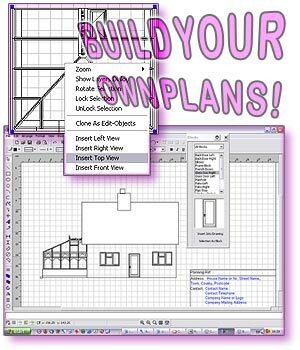 ComfyCAD is a fully featured CAD package that has been built into ComfortableConservatories, empowering you with the ability to create scaled drawings for planning permission and other purposes. ComfyCAD lets you insert one or more views of the conservatory into a plan, at a scale of 100:1 and then using the drawing tools, you can create the customers property around the conservatory ..to scale! The ComfyCAD program has many features and is virtually a complete product in it's own right! You can even save objects that you create in here for future use, further saving time and reducing effort! FACT: Documents created with Comfy CAD can also be emailed as well as printed and as with all its features, this option is at no extra cost. It is included in the low affordable price! ComfortableConservatories includes the Comfortable Surface Designer! The Comfortable Surface Designer enables you to show (and sell) your customer's a whole lot more than just the conservatory! With this extremely useful, powerful new toolset, you can create numerous items to add to the conservatory, garden and other scenes and display in 3D, onto photos! With these amazing 3D capabilities you can branch out into different areas. Sell extra services to a potential customer, at the same time as selling the conservatory. FACT: As with all its features, this option is at no extra cost. It is included in the price, offering even more value to the already feature-rich system! ComfortableConservatories sports the essential ComfyPaint! This new 'Paint' & 'Clone' tool ComfyPaint, contains a valuable set of functions, all of which help you to tidy property photos, before	you finalise the conservatory overlay. Cloning Tool - This is a very powerful feature that lets you select an area of a photo and then clone it to other parts of the photo. Fantastic for painting grass or other items over debris in the garden. Magic Wand Selection Tool - Select photo sections to be either filled or copied. Shaped Selection Tools - Select areas by shape; e.g. ellipse, rectangle etc. Polygon Selection Tools - Define your own shape to select. Brush Function - Make a brush out of a colour or a texture. With these tools you can touch up all, or parts of any property photo to make the scene all the more realistic! To find out more about ComfortableConservatories please click the next button.